Several members of the approximately eighty strong, far left Congressional Progressive Caucus have documentable ties to the Communist Party USA, or its front organizations. 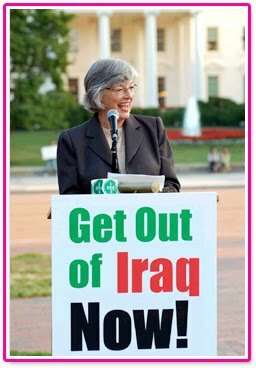 Here's another for the list - none other than Progressive Caucus co-chair and California 6th district Rep. Lynn Woolsey. Nell Ranta, Gail Ryall, Anthony Toney and Doris Brin Walker. 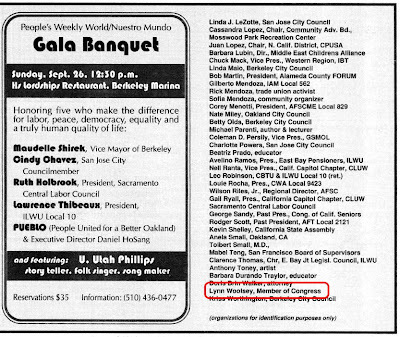 Also listed on the left portion of the advertisement were long time communist front supporter Rep. Barbara Lee and more well known communists, including Arnold Becchetti, Marilyn Bechtel, Delmer Berg , Libero Della Piana and Herb Kaye (aka) Herb Kransdorf. Once Lynn Woolsey would have immediately be flagged as a security risk, for openly supporting a Communist Party fund raiser. Today, the Communist Party supports Cuba and China and strongly opposes the U.S. war efforts in Iraq and Afghanistan. Why then, would a loyal U.S. congresswoman be prepared to co-sponsor a Communist Party event? Good work, Trevor. We love your work! To say that Lynn Woolsey is influential is more than a little bit scary! If you've ever heard her speak, her logic and rhetoric is vacuous and without any reasonableness. She embodies the term "useful idiot". Yet, Nor Cal voters keeping voting her in! I saw her at the local (Petaluma) lefty bakery last Monday and she looked like a deer in headlights. Servers were scurrying about trying to seat "Lynn" (whispered breathlessly) at the best table. As I went up to pay the cashier, I heard one say to the other, "She's a very important person!". I wanted to gag. Communism's alot like cancer,sometimes you can have it for a long time before it's presence is known and in alot of cases it's just too late when you find out.I THINK we found out in time now we need a chemotherapy equivalent for it. The best to be said about Barbara Lee is that no piece of legislation she's authored has ever passed. She's a useless disgrace. It makes me sick that I was gerrymandered into her district. Barbara Lee does not speak for me.